Bluetooth is a short-range wireless connection that many smaller devices use to communicate with a pc/computer. Common Bluetooth connection devices include wireless mice, mobile phones and printers. If your computer can’t see your Bluetooth mouse, printer or other device, there are several things to try to solve the problem. Check that the device is turned on. With a Bluetooth mouse or keyboard, look for a small button marked with the Bluetooth logo or labelled Connect. Hold this button down for about 20 seconds. If the device uses batteries, check to see if they need replacing. The device may be either too close to your computer or out of range. Try moving it closer or a little further away from your computer. Ensure that the right Bluetooth device is being recognised by your computer. You may have several Bluetooth devices of a similar nature in range, such as two mobile phones, that can cause Bluetooth connection confusion. In the Control Panel search box, type ‘Bluetooth‘, and then click Change Bluetooth settings. In the Bluetooth Settings dialog box, click the Options tab, select the Allow Bluetooth devices to connect to this computer check box, and then click OK.
Click the Start button, then click Control Panel. In the Control Panel window, click Hardware and Sound, then click Devices and Printers. 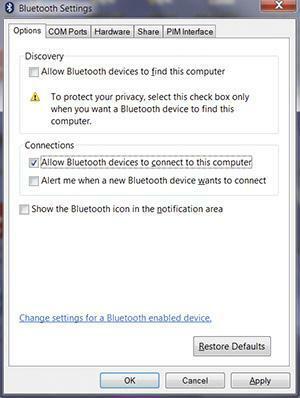 In the list of devices, select the Bluetooth device that isn’t working and click Remove device and click Yes to confirm. Click Add a device, then on the Bluetooth device, press the reset button or make it discoverable according to the device’s user manual. Follow the rest of the steps that appear on screen. You may be asked to enter a pairing code (also known as a PIN or passcode). Most Bluetooth devices need to be paired with your computer before they can transfer information to each other. This stops unauthorised wireless devices from connecting with your computer. The device should now automatically reconnect each time you move it near your computer. Make sure that the device is at the correct distance from the computer. Typically, this is between 6-9 feet for most Bluetooth devices. If a wall separates the device and computer, try putting them in the same room. The device may have other devices trying to connect to it – such as a Bluetooth camera attempting to connect to a Bluetooth printer. Turn off all other Bluetooth devices and try reconnecting the main Bluetooth device to your computer using the steps above. Interference from items that use radio frequencies such as microwave ovens, cordless phones and remote controls, may block the Bluetooth signal. Try moving the device that isn’t working away from such devices. Look for the pairing code in the information that came with your device or it may be printed on the device itself (often on the bottom). Alternatively, during the pairing process, Windows may let you create your own code. If you choose this option, you won’t need to use the code that came with the device.